Until a decade ago, a Chinese company investing in a foreign country was a rare sight. 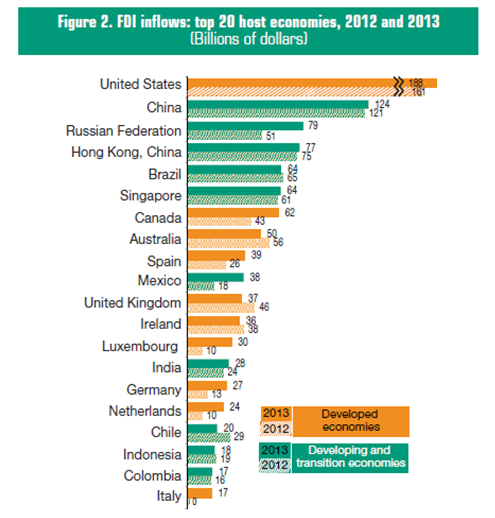 Last week’s UN report puts China among the world’s three biggest investors. The forecast states that China’s foreign acquisitions will exceed China’s inbound investments within two years. The UN Conference on Trade and Development published its annual worldwide investment report last week- the World Cup of the international investment industry. According to the report’s findings, while Europe is still struggling with its’ financial rehabilitation in the aftermath of the global financial crisis, Chinese investors continue to ride forward while purchasing leading companies worldwide. Though many know that China is the world’s second biggest destination country for foreign investment (after the USA), it didn’t even appear in the list of leading 25 destination countries in 2000. Anyone considering investing in China or finding a Chinese investor in those days would have been ridiculed by their peers and colleagues. 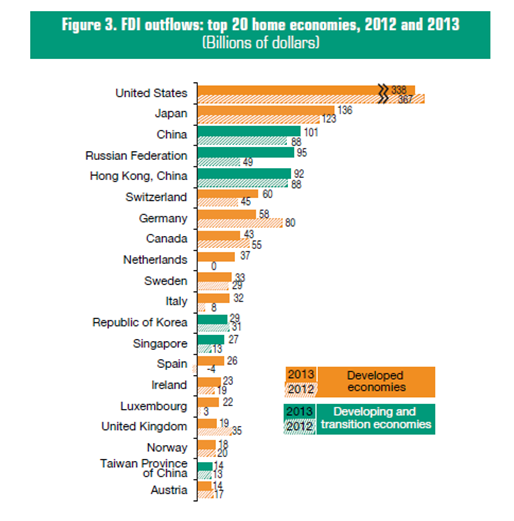 Today it’s clear that the foreign investment market has taken a sharp turn towards Asia. According to the UN committee’s data, approximately 30% of foreign investments are now headed for Asia (approximately 423 Billion Dollars), and the lion’s share of those reach China. Therefore, even though investing in Asia and China is highly complicated and requires patience, an international corporation wishing to survive must develop and implement an Asia, and specifically China oriented business plan. China’s success in the field of international investment is a two-way street, both as a destination country and as a source country. While until a decade ago, a Chinese company investing outside China was a rare sight, in 2013 China was ranked third (after the USA and Japan) amongst source countries investing funds abroad. Despite being ranked third, the overall sum of foreign investments in China and Hong Kong (which is under Chinese rules) actually puts China as the world’s second source country. The wealthy Chinese investors have identified the business opportunities arising in the West following the global financial crisis- and began, with encouragement from the Chinese government, to make big acquisitions throughout the world. Looking at the mega-deals chart (sums of 3 Billion Dollars and above), we can see the world’s major players in this field- USA, China, Japan and Russia. The last years’ growth in the number of Chinese investors is unprecedented on a global scale. While the sum of foreign investments made by American companies has doubled (compared to foreign investments made in 2000), the sum of foreign investments made by Chinese investors is 22 times bigger. This is a race between the American and the Chinese economies, one in which China is taking giant leaps towards the top. American meat, Israeli milk Amongst 2013’s most outstanding deals, one might name the acquisition of control of Nextel, the Canadian gas company by the Chinese company CNOOC, for 19 Billion Dollars, and the acquisition of Smithfield, the American meat company, by Shanghai for 4.7 Billion Dollars. Much like the criticism pointed towards Tnuva, the acquisition of Smithfield, the USA’s biggest pork marketing company has triggered criticism amongst American farmers who objected transferring one of the symbols of the local food industry to Chinese hands. This is the investment world’s way: some object out of fear of what may come; others support out of an understanding of opportunities. Israel is one of the countries who received a constant wave of ongoing Chinese investments, due to the Chinese investors’ understanding of the Israeli high tech industry’s strength. Among the recent years’ most outstanding investments one might mention the acquisition of Machteshim Agan by ChemChina for 2.4 Billion Dollars, the acquisition of Tnuva by Bright Food Group for 960 Million Dollars, the acquisition of Alma Lasers by the Fuson Group for 221.6 Million Dollar and the Chinese tycoon Li Ka-Shing’s investment in the Technion (a 130 Million Dollar donation). According to UN estimations, this trend will continue and within two to three years, the sum of acquisition made by Chinese companies will exceed the sum of foreign investments in China- which shows China growing power. This information is crucial for the Israeli High Tech companies who want foreign investors. China and the USA lead the chart this year, and the battle in this world cup is close. We should remember that in order to successfully cross this road, one must look all relevant ways; west towards the USA and east- towards China. The writer is an Attorney and a Senior Consultant for Dacheng Law Offices in Shanghai, China’s biggest law firm, and specializes in international investments between China, Israel and USA.